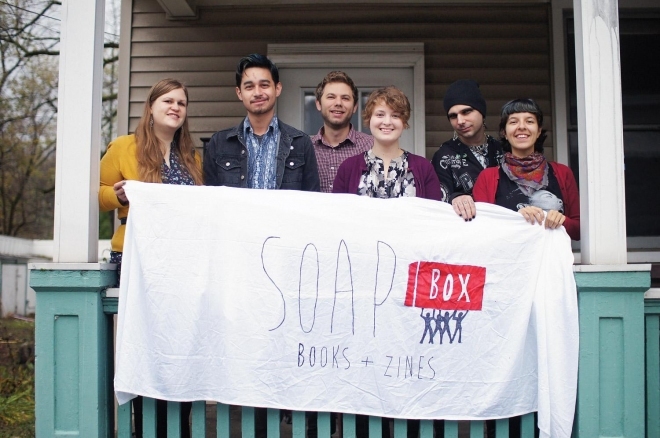 The perpetually hip neighborhood of Northside may be known for its dining and bars, but tucked away on Knowlton Street is the newly established heart of the progressive community — SoapBox Books and Zines, a nonprofit, non-hierarchical, volunteer-run community space with a serious mission. According to SoapBox’s website (soapboxbooks.org), the organization “distributes alternative media, provides the community with access to information and promotes independent and critical thinking,” similar to other infoshops around the world. The topics of the radical books and zines (self-published magazines usually produced by a photocopier) available at SoapBox range from feminism to philosophy. The space is also used for meetings, community-building projects, events, skill-sharing and education. SoapBox was conceived when Cincinnati native Kyle Galindez spent a recent summer traversing the West Coast, visiting cities including Seattle, Portland, Ore., and Santa Cruz, Calif.
Galindez then took the idea and made it into a reality; with the help of friends and those he met through the Occupy Cincinnati movement, SoapBox hosted its grand opening in May of this year. Since then, the organization has lent out a multitude of books to members in the community, organized successful events and meetings, held political theory reading groups and hosted the “Letters to Prisoners” series in which members write letters to prisoners of conscience — people who have gone to jail for political action. “The work we do with the letters to prisoners project reaches all around the U.S.,” Nancy Paraskevopoulos, a committed volunteer, says. Paraskevopoulos and another devoted volunteer, Robert Inhuman, were the “ringleaders” of the recent Queer Power Benefit that took place on Oct. 12 and drew in almost 200 participants, raising about $500. The money will go toward expanding the library. “We are generally trying to do [an event] each month,” Inhuman says. “The next event is going to be a play titled Know Your Enemy from Insurgent Theatre, which is a touring theater group. They will also present a feature-length documentary inspired by a prison uprising in Lucasville.” This will take place on Wednesday, Dec. 11 at 6 p.m. Inhuman believes that these interactive events are crucial. The community will have another way to get involved as SoapBox spreads into a new room connected to the building. The organization plans to increase its library size and help visitors create their own zines.